Explanation: When did galaxies form? To help find out, the deepest near-infrared image of the sky ever has been taken of the same field as the optical-light Hubble Ultra Deep Field (HUDF) in 2004. 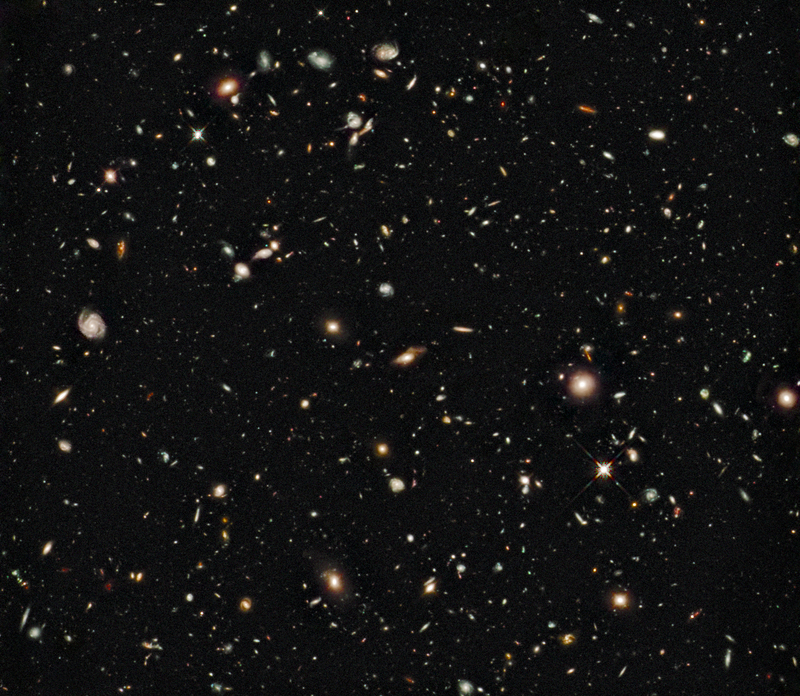 The new image was taken this summer by the newly installed Wide Field Camera 3 on the refurbished Hubble Space Telescope. Faint red smudges identified on the above image likely surpass redshift 8 in distance. These galaxies therefore likely existed when the universe was only a few percent of its present age, and may well be members of the first class of galaxies. Some large modern galaxies make a colorful foreground to the distant galaxies. Analyses by the HUDF09 team indicate that at least some of these early galaxies had very little interstellar dust. This early class of low luminosity galaxies likely contained energetic stars emitting light that transformed much of the remaining normal matter in the universe from a cold gas to a hot ionized plasma.